The debate chairman said change was on the way and it could be “scary”. Catch up on the wide-ranging debate held by the South East branch of the Country, Land and Business Association. 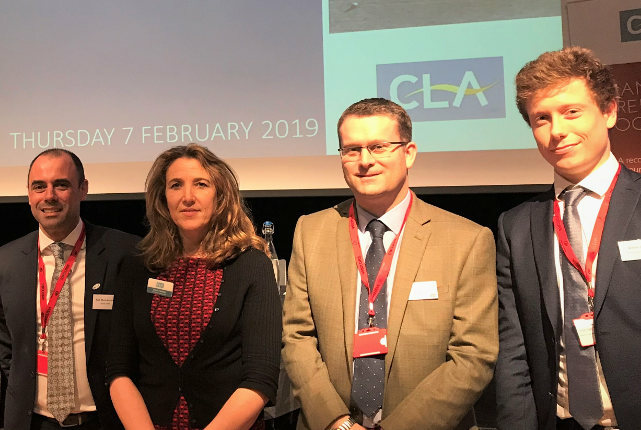 Different visions of what the future of farming may look like were set out during the CLA’s latest debate, with speakers and audience members clashing over veganism’s impact on biodiversity. While there was acknowledgement of – and enthusiasm for – the need for change among many present at the event, ridding land of livestock was widely rejected as impractical and harmful. Sponsored by Savills and Brachers, the South East debate looked at the challenges and opportunities the industry is likely to face over the next decade. Scientific, vegan and land management voices were among those to feature on the panel, who gathered at MidKent College in Gillingham. William Gildea, campaigns and policy officer at The Vegan Society, said the UK’s vegan population had been doubling every two years, from 150,000 in 2014 to 300,000 in 2016 and 600,000 by last year, and offered a solution to climate change and health crises. Mr Gildea disagreed with fellow speaker Susan Twining, Chief Land Use Policy Adviser at the CLA, on the issue of animal welfare, arguing he did not believe standards were at a high level. He instead promoted a future vision of plant-based farming where rewilding “can play a key part”. “During foot-and-mouth in 2001, livestock was removed from land and it affected fragile ecosystems even in a short space of time. I can’t see how suddenly taking out livestock production would work. Antonio Fletcher, employment partner at Brachers, said farming populations were ageing and declining, which could cause issues with continuity and sustaining levels of production. Farmers cannot simply rely on migrant labour in the future, so must embrace technology and mechanisation, he said. Ms Twining agreed, arguing agriculture invests less in training and development than many industries, and needed to catch up. Professor Mario Caccamo, head of crop bioinformatics at NIAB and managing director of NIAB EMR, said farming had a positive future. For many in the audience, a meat-free future was deemed unpalatable, with one member passionately insisting “planes are worse than cows” when it comes to harmful emissions. But change is coming. As debate chairman and CLA member Gary Walters concluded in his closing remarks, it could be “scary” as it will affect livelihoods, although great opportunities will also present themselves for those who look forward, embrace science, technology and training, and strike a balance between environmental and financial sustainability. “All eyes will be on Brexit over the next few months, but as this debate showed there are wider changes facing farming and the rural economy.